Darick Pead as Beast and Hilary Maiberger as Belle star in Disney’s “Beauty and the Beast,” on stage at Shea’s through Sunday. A tale as old as time: A dude-bro with anger issues imprisons a girl he likes, intimidates her to tears, starves her out of spite and then magically threatens his way into her heart. Yadda, yadda, yadda, “Be Our Guest,” Happily Ever After. That, in a nutshell, is the insane plot of “Beauty and the Beast,” one of the most sexist stories ever written into the popular imagination and as shimmering a depiction of female subservience as any Broadway show in history. And whatever unsettling things this says about our culture, it is also one of the most beloved. A six-day run of the production, caked in glitter and exploding with charm and talent, opened Tuesday in Shea’s to an ecstatic reception from the young crowd. The production is absolutely spotless, powered by a gifted and eager cast who appear as much like cartoons as the 1991 animations on which their characters and costumes are based. As Belle, Hilary Maiberger is the picture of youthful promise and gentility, delivering moving renditions of Alan Menkin’s addictive songs and Sir Tim Rice’s characteristically clunky lyrics. Tim Rogan plays the brash and abusive Gaston, a character whose merciless pursuit of Belle would be terrifying in any other context, with gallons of swagger. And as the main offender, Darick Pead wrings what droplets of humor and humanity he can out of his one-dimensional character. There’s no denying that this production, the film version of which was hailed as the best musical of the year by no less than Frank Rich, has manifold charms. Foremost of these is its spare-no-expense number “Be Our Guest,” which even in this touring, non-union production was a grand and irresistible spectacle worthy of Broadway. But what exactly is underneath all this pretty packaging? When you boil it down, there’s no way for a child who sees this particular version of the fairy tale to come away with a lesson that is remotely useful in 2014. 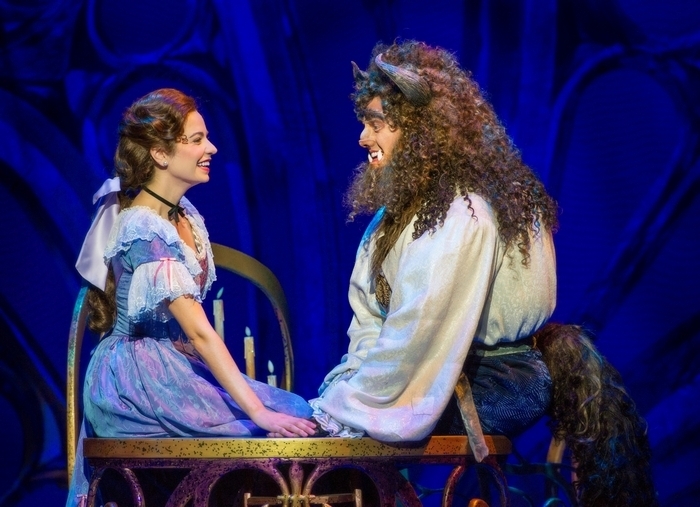 There’s an important difference between a show like “Beauty” and newer all-age Broadway fare like “Wicked” and “Shrek,” which twist the sexist and racist threads of our outmoded fairy tales into something at least marginally more progressive. Seasoned filmgoers, when they watch Jean Cocteau’s masterful 1946 interpretation of the tale, can appreciate it for its visual innovations or its poetic tone and dismiss the sexist nature of the story. Children see and hear a simpler tale: An abusive man whose abuses are instantly forgiven, a beast tamed by a lovely young woman whose existence is dedicated to serving men, with occasional breaks to read books. At a time when as many as a quarter of college women experience a sexual assault, it’s worth considering exactly why we allow this to happen. I don’t think it’s a stretch to theorize that a culture so permissive of sexual abuse thrives, as any culture does, on the stories we internalize as children without even knowing it. Stories, much as fans of the musical and the film may hate to acknowledge it, just like this one. It really is a tale as old as time, a song as old as rhyme. True as it can be.